Still planning a summer getaway before the country’s weather bureau officially announces that dry season is over? Why not head to Baler, the capital of Aurora Province, up north and enjoy places and activities it can offer. Baler is famous for surfing activities. Swim, surf, and feel the water of Pacific Ocean in Sabang Beach, one of the most perfect surfing destinations in the country. It may not have white sand to offer but the experience of swimming and playing in Earth’s largest ocean will give you some bragging rights. You may choose to bring your own surfboard or go for a surfing lesson offered by hotels at the beachfront costing Php 350 or some USD 8 per hour. Nights are never boring in Sabang Beach as some hotels hold themed parties and there are bars perfect for drinking and chilling. Another perfect thing in Sabang Beach is its sunrise. Since Baler is in the eastern part of the country, experience the combination of scenic sunrise, Pacific Ocean’s waves, and the mountain ranges of Sierra Madre. For only Php 300 or around USD 7, relax and chill in the beautiful cove of Dicasalarin in Baler.Dicasalarin Cove, a private property owned by Costa Pacifica (located in Sabang Beach), is a perfect destination for your last two minutes summer getaway. 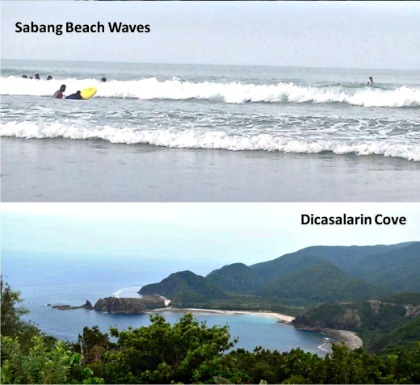 Dicasalarin Cove is open from 6 a.m. to 6 p.m.
On your way to Dicasalarin Cove, have a little trek to Baler lighthouse and take shots of picture-perfect scenery of the Pacific Ocean and the beauty of Baler. Get lost and get hungry as you’ll enjoy the road trip in Baler and love its mouth-watering and affordable food. Enjoy the view of Sierra Madre mountains in your road trip and discover other interesting places within Baler. You may start your road trip from Dicasalarin Cove and stop at Aniao Islets before heading to Baler proper. Within Baler proper, you may visit Quezon Park, Museo de Baler, and Doña Aurora Quezon ancestral house. Best inihaw (grilled food) in Baler is at Yolly’s Inihaw at Quezon St.
Aside from the usual grilled pork and chicken, its Bulalo is one of a kind, and its seafood such as shrimp and lobsters are must-try. From Metro Manila, ride Genesis Bus heading to Baler in EDSA, Cubao. This will be a six- to seven-hour ride with fares ranging from Php 450 for the regular trip and up to Php750 for a non-stop trip.